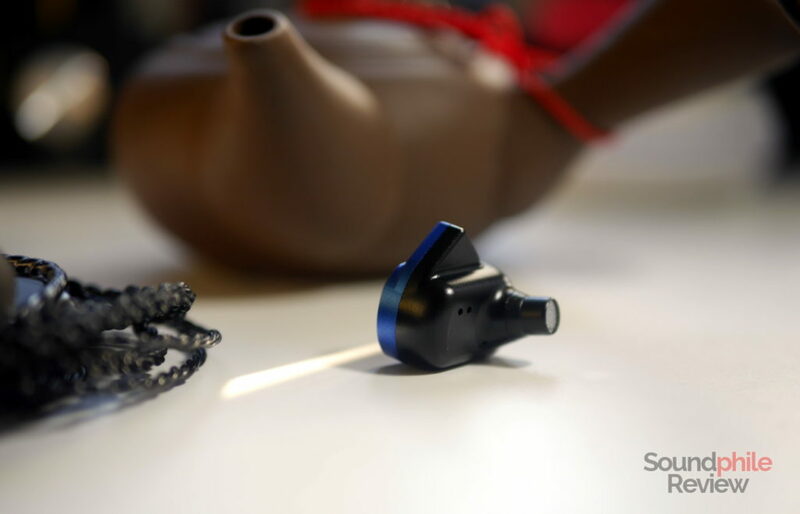 BQEYZ’s variegated line-up of in-ear headphones includes many multiple-driver products that make use of both dynamic drivers and balanced armatures in more-or-less traditional configurations. 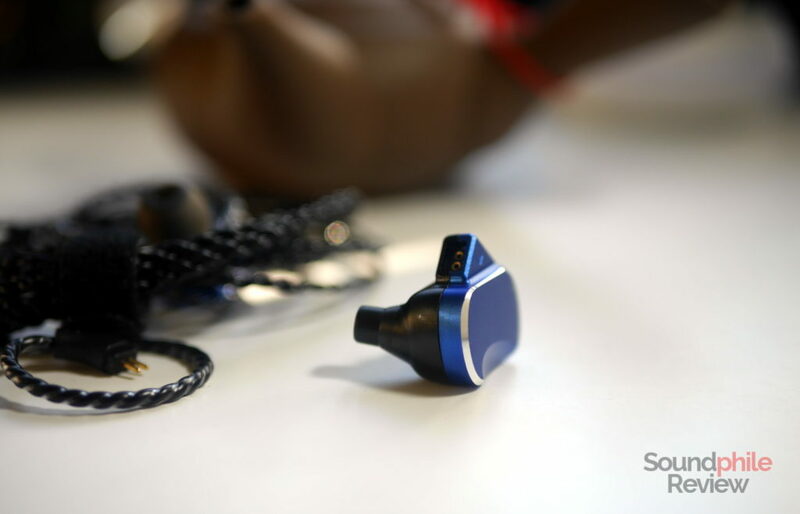 The BQEYZ BQ3 uses four drivers for each earpiece: two dynamic drivers and two balanced armatures. The company did a good job of tuning the drivers to create a fun tuning. Disclaimer: AK Audio provided me with a complimentary sample. They sell the BQEYZ BQ3 on AliExpress at ~$60. BQEYZ does not distance itself too much from the competitors in terms of stock accessories, though they provide the BQ3 with a good number of accessories. 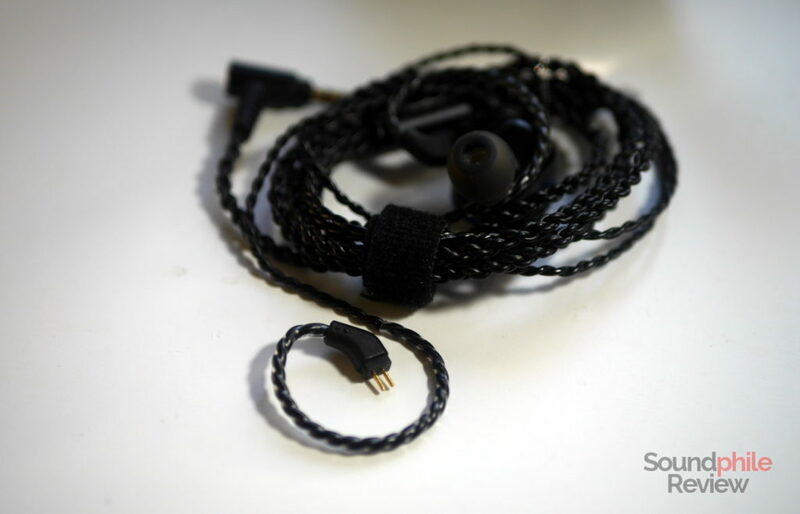 The black cardboard box holds the earphones, a cable, three pairs of silicone tips and a soft fabric bag. Plain, simple designs are arguably the best ones. That’s why most products designed this way stay relevant from a design perspective even after many years. That may not be the case with the BQEYZ BQ3, but they certainly look simple and elegant. 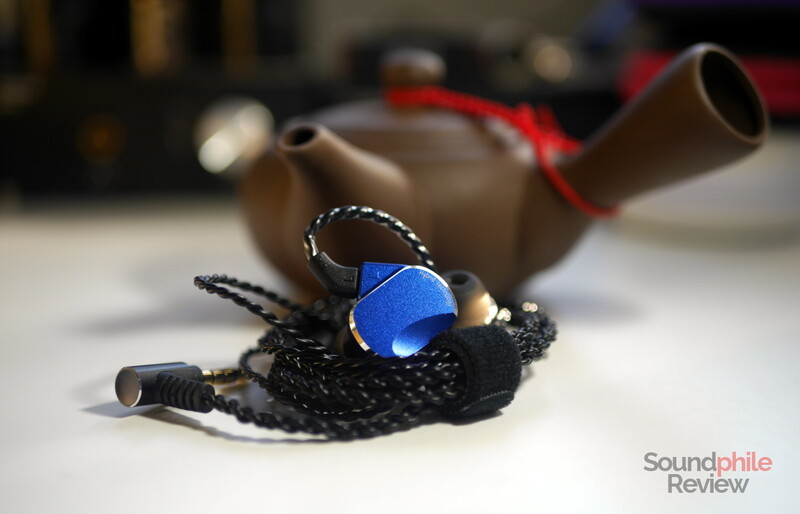 Their almost-oval shape with a cutout on one side sets them apart from most of the IEM market. This is not the usual Andromeda rip-off! The housings are entirely made of aluminium: there are two pieces jointed almost perfectly. The faceplate (and a part of the sides) is coloured bright blue, while the rest is matte black. The edges are silver, so they stand out a lot. There is a protrusion on the top that hosts the 2-pin connector. Due to the large size and the shape of the housings, the BQEYZ BQ3 are not the best when it comes to comfort. They tend to press against the pinnae, causing discomfort in a matter of minutes. Finding the right position is key in order to get a good fit and therefore to be comfortable with the earphones for a decent amount of time. I had to continually move the earpieces in order to keep discomfort under control; even so, though, I could never get past the hour mark before I needed a pause. 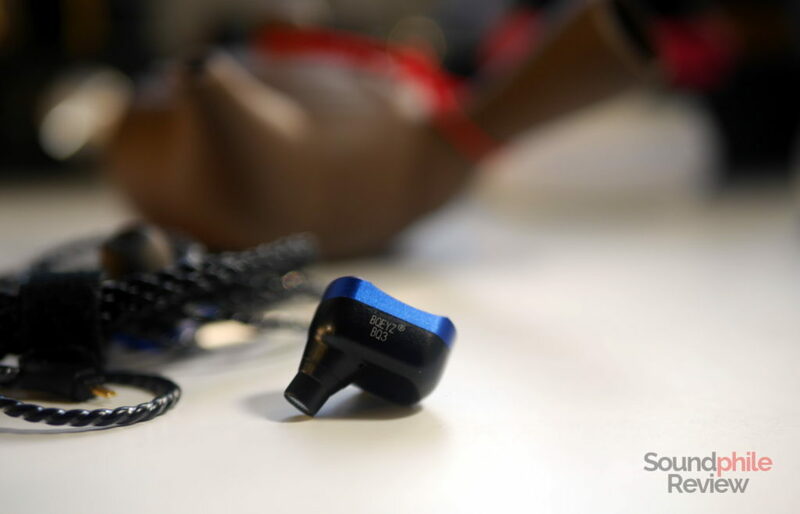 Though they are not at the same level of highly isolating earphones such as the Shozy x Neo CP, the BQEYZ BQ3 offer somewhat decent isolation even when dealing with highly noisy environments such as public transport or busy streets. They allow one to keep the volume low, so as to protect the hearing, but they won’t be able to shield you from louder sounds. The cable is a bit poor and not too distant from those included with KZ earphones: it is flimsy and inclined to form kinks, and its flimsiness also makes it easy for it to tangle. It seems built well, with decent quality materials and the bare minimum in terms of accessories (i.e. it has a chin slider). It is a bit prone to microphonics, so it is not the best in terms of comfort – speaking of which, the horrible tendency to curl up of the ear hooks makes them press against the pinnae and cause discomfort that sums up to that caused by the shells. The BQEYZ BQ3 was tested using the following sources: xDuoo X3-II, Audirect Beam, Hidizs AP200. Source files were standard-res FLACs for the most part. The BQEYZ is advertised as having five drivers: two dynamic drivers and three balanced armatures. Reality is a bit different, though: there is in fact a dual-diaphragm dynamic driver working alongside two balanced armatures, one of which is a dual package. The real driver count sits therefore at three drivers per channel instead of five. The sound signature is markedly V-shaped, with powerful bass and raised treble that enclose recessed mids. It sounds fun, but it can also be a bit excessive if used to listen to the “wrong” genre. Not that there are absolutely right (or wrong) genres, but genres that privilege the midrange will not sound to their best, and even other genres might sound a bit hollow due to this signature. Despite the presence of multiple drivers, instrument separation is not really great and often leaves you listening to tracks that sound a bit flat and where it’s difficult to really hear all the different instruments and their details. This flatness is carried over to the soundstage, that appears barely sufficient in its breadth and absolutely flat in terms of depth. It always sounds like the instruments are playing inside your head. Imaging, on the other hand, is quite decent, as instruments are positioned in different points in space and, although there is no particular accuracy in that, it allows one to have an idea of where the instruments are. With such a pronounced V-shaped signature, bass comes out on top of the rest and is the star of the show. It is mostly concentrated in the mid-bass section and reaches reasonably deep at around 40 Hz, with a rapid roll-off below that mark. This all seems rather standard in this price range and kind of signature, so the BQEYZ BQ3 does not stand out of the crowd. Bass appears to be predominant, but this position is not one of quality: although there’s enough detail for it to show some texture, it’s mostly low-detail stuff that can’t keep up with multiple lines and crowded situations as it ends up mashing everything up. Not that it isn’t enjoyable with electronic music, but it is not really accurate either and shows its limits with any moderately complex track. This is related to speed, which is limited: lows are not well controlled, as it’s apparent with transients that are far from being instantaneous and full of impact. It still has enough punch to be highly involving and immersive and is therefore great for music that requires those features. Mids sit noticeably behind bass and treble, as even tracks such as Daft Punk’s Give Life Back to Music where mids are undoubtedly front and centre sound a bit distant and leave you wanting for more volume. Raising the volume only does so much, though, as the sound signature won’t change and the issue will persist even after adjusting the volume (and this doesn’t come entirely as a surprise, does it?). They sit at the back, but they seem to have a weird spike in the upper range that is still rather noticeable. Tonality is thus a bit compromised and I find it to be somewhat fatiguing on the long run. Now, mids are fairly fast, but they’re still not overly detailed and display just what I’d call a sufficient amount of detail. Treble perplexes me. It has a more-than-decent amount of details, but they’re all concentrated in the lower part of the range, so they’re “warm” and lack air and sparkle. Extension is not their strongest point by any stretch and, to the contrary, it is somewhat limited. This is the cause of the aforementioned lack of air, but it also means a host of details is lost. I would say that, given their frequency response, the BQEYZ BQ3 are good with genres that require slamming bass and emphasised highs – electronica, hip-hop and so on. I wouldn’t use them to listen to classical or jazz, for instance. BQEYZ K2: the K2 are a bit more balanced than the BQ3 while keeping a V-shaped tuning: their midrange is more emphasised, so the “V” shape is not as dramatic. In fact bass is similarly elevated, but it is countered by a bit more presence in the midrange and more presence and extension in the treble area which lighten the sound as a whole. They are similar in terms of technical ability, including detail retrieval, but soundstage is a bit more open thanks to treble. I would say the BQ3 are more tuned towards fun, while the K2 are more accurate. BQEYZ KC1: the KC1 are similar to the K2, but they have a bit more bass. Their tuning is otherwise really similar, so you can take the above comparison as a reference. RevoNext QT2: although the QT2 have a V-shaped tuning, they are more balanced. Bass is less forward and less invasive, the midrange is more elevated and more easily heard and treble is much more extended and detailed. Better balance makes them much better all-rounders. In terms of quality, there is more detail across the whole range, as there’s better control. They’re also better on the technical side, having much larger soundstage, better instrument separation and better imaging. TRN V80: the V80 appear almost bright in comparison to the BQ3, though they’re not. This is because bass is less present and treble is more emphasised, but midrange is also further forward than on the BQ3. While BQ3’s bass may be more fun, it appears less accurate and more invasive. In terms of quality, the sound appears to be more convincing on the V80 due to better speed and better detail (especially in the treble area). Soundstage is also larger, while imaging positions instruments more accurately and instrument separation does a better job at making you discern the different instruments. While there is a lot to like when it comes to design and build quality, which are uncommonly good, the BQEYZ BQ3 falter when sound quality is taken into account. It’s not that they are inherently bad, because they clearly are not. On the contrary, they’re satisfying if you want fun. They are not if you want to actually delve deep into the music and listen to the small details and “hear the music as the artist intended” (okay, I am officially joking: that’s just a nonsense claim a terrible company appropriated). 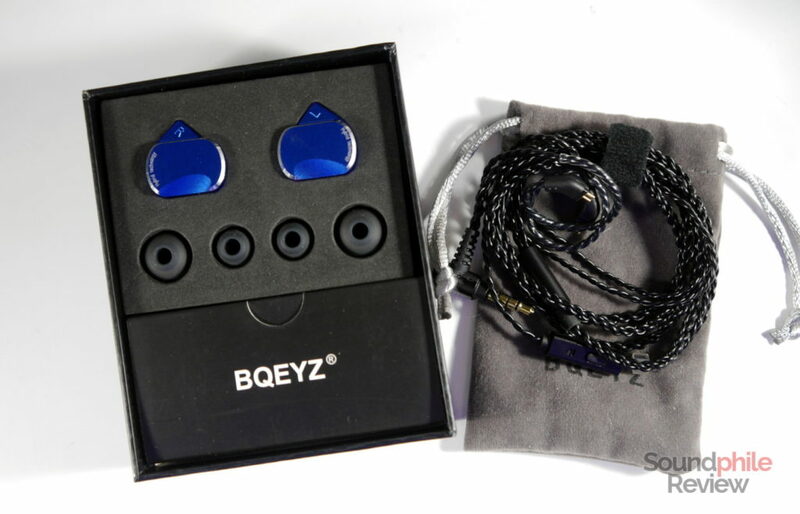 On a more serious note, the BQEYZ BQ3 are not as convincing as the competition and that’s the issue: while they may be good on their own, the competition offers better features at the same price, so that’s why I recommend you to get one of the competing IEMs mentioned above.